Why is Microsoft Dynamics GP better than DacEasy? Developed by Sage, DacEasy is an entry-level accounting software solution designed primarily for startups and smaller businesses. In late 2014, Sage announced that DacEasy would reach end of life on September 1, 2016. This means that no further updates or releases will be available and that Sage will no longer offer support to customers who are not already enrolled in a Sage Business Care plan. In light of this news, many companies are looking for a reliable alternative to DacEasy. 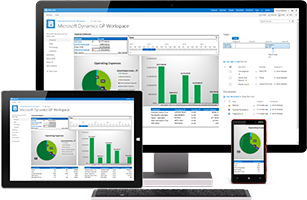 Microsoft Dynamics GP is targeted to the SMB market. As such, it is the most affordable accounting software solution with the richest set of functionality either on-premise or in the cloud and is installed and upgraded on your own terms and schedule. The whole point of an accounting software solution is comprehensive and actionable financial reporting. Microsoft Dynamics GP offers over 700 standard reports – that’s almost ten times more than DacEasy’s 75 standard reports. In addition, Dynamics GP’s advanced reporting tools allow users to create, customize and schedule reports to be printed automatically at pre-determined intervals and delivered to the appropriate recipients via e-mail or publishing to the company’s business portal web site. Scan and attach an unlimited number of documents to any part of the system with workflow approvals. Dynamics GP comes with over 70 integrated modules available right out of the box. Compare that with the 22 modules that come with DacEasy and it becomes clear that Dynamics GP offers a greater degree of flexibility and customization that enable it to meet a wide range of business needs. Dynamics GP modules enable functionality in the areas of distribution, manufacturing, supply chain management, field service, human resources, project accounting, business intelligence, and more. Several end-user tools are available to Dynamics GP users to allow them to set up Dynamics GP to the exact way they want to work. These can be configured by individual user or group of users (user classes) to ensure consistency across your organization. Interfaces can be easily automated via a visual mapping integrator tool. No more double keying Journal Entries and/or bringing in data without data validation from 3rd party operational systems. Dynamics GP offers a web browser accessible client interface that negates the need for complicated setup of user desktops. Regardless of where your users are the GP Web client provides them with secure, encrypted access to your Dynamics GP environment from any location in the world.